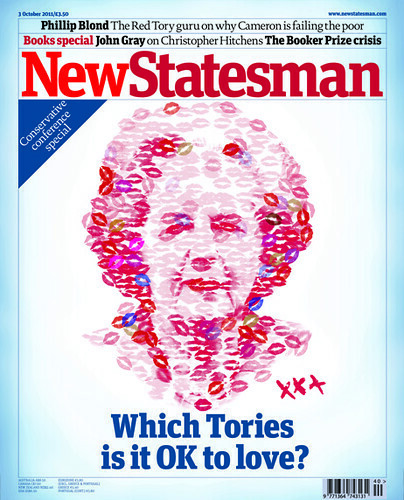 In this week's New Statesman: Which Tories is it OK to love? In this week's New Statesman, as part of our Conservative conference special we ask eight progressives to nominate their favourite Tory, with choices including David Marquand on Harold Macmillan, Andrew Adonis on Michael Heseltine and Maurice Glasman on Edmund Burke. Pick up a copy of the magazine to see who chose David Maxwell Fyfe and Margaret Thatcher. Also this week, Conservative guru and author of the 2009 Red Tory thesis Phillip Blond outlines the party's missed opportunities, the ruin of the 'Big Society' and how David Cameron is failing the poor. Tory MP Louise Mensch talks to Jon Bernstein about her past attraction to New Labour, Nadine Dorries and abortion, and her next chick-lit novel, and Rafael Behr reports on restlessness in the coalition cabinet. Elsewhere, following the Labour leader's conference speech, Mehdi Hasan plots the future for Ed Miliband, David Blanchflower considers the upside of the eurozone crisis for Britain, and Ben Smith writes from Washington on Elizabeth Warren, the grandmother taking on Wall Street and bringing hope to the US left. All this plus an Autumn books special featuring John Gray on Christopher Hitchens's Arguably, James Ball on the Julian Assange autobiography, and Shakespeare scholar Jonathan Bate on our obsession with the Tudors. Alice Gribbin is a Teaching-Writing Fellow at the Iowa Writers' Workshop. She was formerly the editorial assistant at the New Statesman.